Firefighters are at increased risk of death and injury due to trauma while working inside burning buildings. 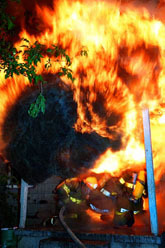 Extreme fire behavior is frequently a causal or contributing factor in traumatic fatalities during interior structural firefighting operations. Lack of experience is often a factor in traumatic firefighter fatalities. While training alone will not replace actual fireground experience, effective CFBT can significantly increase firefighters' knowledge, understanding, and safety. CFBT-US LLC is committed to reducing firefighter injuries and fatalities by helping firefighters and fire officers develop a higher level of understanding of practical fire dynamics and its application on the fireground. We do this by providing a wide range of training and consulting services built around the concept that a sound understanding of fire behavior is critical to safe and effective operations on the fireground. Our staff draw on current fire behavior research and practical firefighting experience in the delivery of effective training to fire service agencies around the world.